Is walking your dog a chore? Does your dog chase every squirrel and blowing leaf? Does your dog bark at every dog that it sees on its walk? When people want to pet your dog do you have to avoid the situation because you know that your dog will jump all over them? If you answered yes to any of these questions then you will be happy to know that all of these problems can be fixed by simply conditioning your dog to a leash and collar prior to going for a walk. 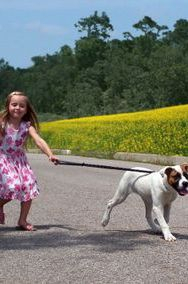 Since we are not asking the dog to submit to person, even a four year old child can walk your dog after you have shaped your dog’s thought process! For many years people asked me how I learned to train dogs, I always said I really did not know. I shared with them that, when I was young, I took a basic dog training class but I do not train dogs in the manner that I was taught. Then one day, while I was reflecting on my life, I realized that I had strayed away from God at different times and life seemed to have more negative consequences than positive ones. God has never tried to control me and therefore I have to make my own decisions. when I had had enough negative consequences such as soured relationships or lack of enjoyment from my work, I always came back to God. Instead of making me focus on the negatives he was there for me with open arms and a lot of love, I realized that all I had to do was to make the right choices and everything in life went well. This training method always seemed to just come from inside me until the day I realized that I just worked with dogs the way God works with me. God had never told me that I was not allowed to make wrong choices, God was always there when I chose to come back to him. For some reason I was happier and more prosperous in all avenues of my life. It was always my choice and I liked making my own decisions. I have always been very independent, but I know that I always feel very secure knowing that life is always good when I'm in God's circle. Teach your dog that in your own circle there will always be safety, respect and a lot of love, and you will become God to your dog. After many years of observing dogs, I have created a unique way of providing dogs with an education that will last a lifetime. 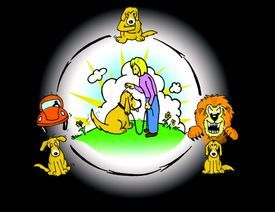 This method is called the “Circle Concept.” By using your dog’s natural reactions to nature, we will be teaching them that you are a positive entity. They will begin to believe they were put into your care so that nothing bad could ever happen to them. You will be there to protect them from all the dangers or negatives that life has to offer, such as being run over by a car. When dogs are educated through this training process, they will not know the difference between playing ball and playing obedience. Their tails will be wagging, their eyes will light up with excitement and they will look forward to each new lesson. Most advice given in dog training is black and white, never do this or always do that. I hope to bring you to your dog's perspective, and be able to show you how to have fun with your dog without bringing out any bad habits. In my training theory, contrary to most training theories, my dog is my equal, unless it demonstrates dominant or aggressive behaviors towards me. In this method of training, we will not be making our dogs subservient to us. The only time a dog has to be submissive to a person is if it is demonstrating extreme dominance or aggression. Unfortunately, in today's training theories, there seems to be either a black or white way of training. Black is when the dog has to submit to us to learn. White is when the dog just performs tricks for treats. I consider my method the gray method. I separate temperament from learning ability. A dog does not have to submit to learn to sit or to come, but it does have to submit if it thinks it can bite people. 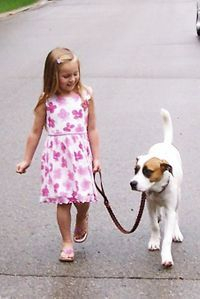 Many trainers believe that if they force a dog to learn obedience then the aggression will be corrected. However, even if a dog is very aggressive when it comes to my school, I teach obedience and correct aggression. With this method I use a correction to get attention not to cause pain to a dog. With my gray method, we will not be using treats for tricks, nor will we be using gimmicks such as clickers. We will be teaching your dog that choosing to listen is better than choosing not to and that playing obedience is just as fun as playing ball! I chose to call my method "the Circle Concept", because I found that the more control we apply to a dog, the more fights and resistance the dog will display towards us. If you try and make your dog do something, it has only two choices: fight back or submit to you. If I want my dog to "choose" to work with me, I will not be able to "make" it do something. So, if we cannot use the leash to hold the dog besides us, and we cannot use the leash to pull the dog to us, then how are we going to convince the dog to want to hang out with us? They have to be close to us in order for us to teach them anything. We do that by convincing them that when they are with us, nothing bad ever happens, and when they are away from us, bad things will happen. Through this method our dogs begin to trust us and look to us for guidance, because we become God in their eyes. A negative is anything that gets your dog’s attention long enough for them to acknowledge you praising them. My training method has changed the way people think about dog training, simply by proving a ten week old puppy can learn just as well as a ten year old dog, competing a show dog in obedience, and showing an "aggressive" dog can be cured; I have revolutionized the idea of dog training. I always believed you can either yell at a dog or you can teach it something. Like God, I never yell, I don't tell them what they have to do, I am simply there to guide them down the right path, and be there for them when they choose to be with me. by coming to Linker Learning Centre for Dogs, to have your loved one trained, you get the opportunity to show your dog that true Heaven on Earth is with you.